Available as low as $42.99 per coin over spot! 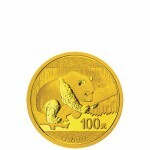 The Gold Chinese Panda is one of the world’s most popular bullion coin programs. 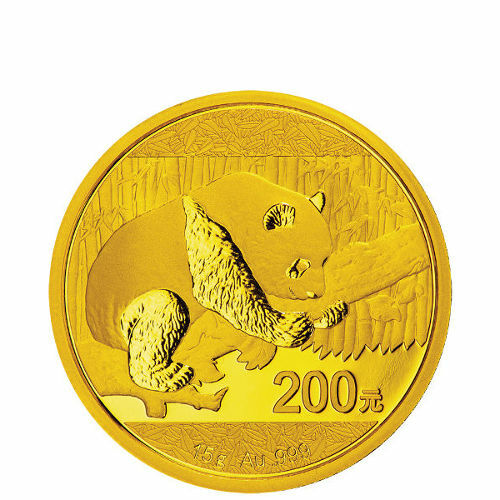 Struck each year as part of a larger program that includes both silver and gold coins in proof and bullion, the Gold Chinese Panda coin is produced by the Chinese Mint in a variety of weights. 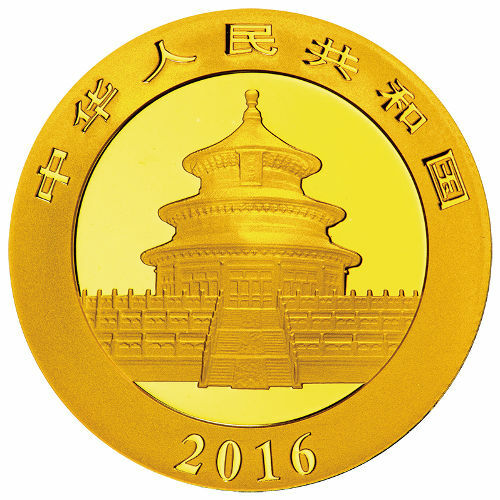 Right now, the 2016 15 Gram Gold Chinese Panda coin is available on Silver.com. Mintage capped at 600,000 coins for 2016! Ships sealed in original mint plastic. Consists of 15 Grams, or .4823 troy ounces, of .999 fine gold. Bears a face value of ¥200 (Yuan) backed by the Chinese government. Features the latest Giant Panda design. The Giant Panda is a national symbol for the People’s Republic of China. Found throughout the central and southern mountainous regions of the country, the panda is a beloved creature that captures the imagination of millions around the world. 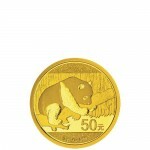 Gold Chinese Panda coins were first introduced by the Chinese Mint in 1982, and were just the third gold bullion coins introduced following the South African Krugerrand and Gold Canadian Maple Leaf. 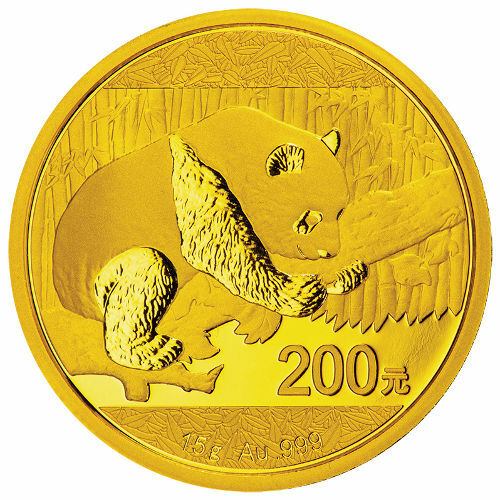 Gold Panda coins were originally available in 1 oz, ½ oz, ¼ oz, and 1/10 oz. In subsequent years, the 1/20 oz, 5 oz, and 12 oz coins were introduced. As of 2016, you’ll notice a slight difference in the engravings on the Gold Chinese Panda. The Chinese Mint has ditched the use of ounces in weights for its coins, opting instead for grams. For 2016, the Gold Chinese Panda will be available in 1, 3, 8, and 30 Grams, in addition to this 2016 15 Gram Gold Chinese Panda. On the obverse of the coin you’ll find the image of a Giant Panda. The bear is featured crawling along the trunk of a fallen tree, with a wall of bamboo framing the background of the image. The reverse of the coin features the Temple of Heaven from south-central Beijing. The Chinese Mint was founded in the late 19th century, but condensed and solidified under communist rule during the 1950s. 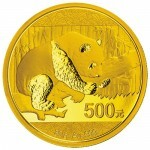 Gold Chinese Panda coins do not bear mint marks, but are likely produced at facilities in Beijing, Shanghai, and Shenyang. If you have questions, please don’t hesitate to contact Silver.com associates. You can contact us on the phone at 888-989-7223, chat with us online, or email us.